You may not be aware, but Pocillopora, despite being one of the less popular stony corals in the reef aquarium hobby, are second only to Acropora in reef building productivity in the wild. Their skeletons make up a huge portion of the reef’s structure in the ocean. Pocillopora are one of the most adaptable SPS corals in that they tolerate a wide range of both light and flow. At Tidal Gardens, we grow them under medium light and medium flow, but they do develop better coloration under stronger light. If you want to experiment with stronger light, be sure to acclimate the coral slowly, because it is possible to burn them if this is done too hastily. The other aspect that makes Pocillopora a highly effective reef building coral is its growth rate. It is one of the fastest growing stony corals and has a trick up its sleeve if things go downhill. Pocillopora can reproduce asexually by means of polyp bailout, where each polyp can detach from its skeleton and drift to a new location to colonize. 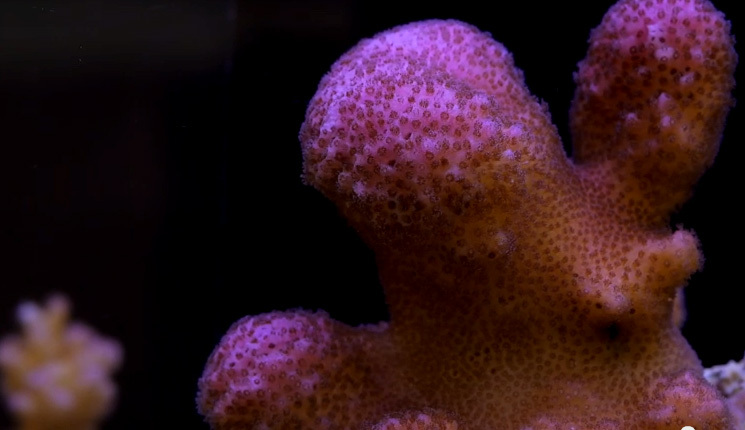 While this technique is not unique to Pocillopora, this coral does it far more effectively than others. Usually polyp bailout is employed as a last-ditch effort in response to something going wrong. Other stony corals such as Elegance and Bubble corals bail out, but most of the time those corals do not survive. Pocillopora, on the other hand, can spread all over the tank and wind up recolonizing in unexpected crevices. As for feeding, Pocillopora do not appear to need it as much as other corals. These corals are photosynthetic and get most of their nutrition from light; however, it is possible to feed them, provided that the food is fine enough for their small polyps to consume. Start with the cloudy supernate you get from thawing frozen food, or possibly one of the powdered zoo plankton foods when attempting to feed. Remember to not overdo these fine foods, because the risk of exceeding the tank’s filtration capacity is far worse than not feeding at all. Lastly, these corals tend to be very hardy, but if you happen to see mysterious die-off occur, consider giving it a dip in a pest control solution. There are some crustaceans that eat Pocillopora, so it is important to keep a watchful eye on the base of the coral for any signs of recession. The bugs look like big white fleas and will jump off quickly when dipped. Let us know your experiences with Pocillopora!